Ragnarök retells the finale of Norse mythology. A story of the destruction of life on this planet and the end of the gods themselves. 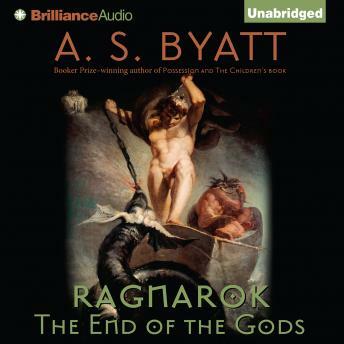 Just as Wagner used this dramatic and catastrophic struggle for the climax of his Ring Cycle, so A.S. Byatt now reinvents it in all its intensity and glory. As the bombs of the Blitz rain down on Britain, one young girl is evacuated to the countryside. She is struggling to make sense of her new wartime life. Then she is given a copy of Asgard and the Gods—a book of ancient Norse myths—and her inner and outer worlds are transformed. How could this child know that fifty years on many of the birds and flowers she took for granted on her walks to school would become extinct? War, natural disaster, reckless gods and the recognition of impermanence in the world are just some of the threads that A.S. Byatt weaves into this most timely of books.